GOLDENWINGSHORSESHOES are designed to accommodate all the uses that mankind imposes on the horse by using researched and state of the art materials combined with philosophies that provide true and studied principles to maintain soundness of your horse. GOLDENWINGSHORSESHOES are specifically designed from the hoof to the spine of the horse. They are intended to preserve and protect each muscle group, all tendons and ligaments, and all bones. This innovative shoe benefits the horse from the hoof to the spine. GOLDENWINGSHORSESHOES aim to prevent interference and lameness in horses. Lameness is any movement with abnormal gait due to pain in any part of the body. It is a documented fact that much lameness is caused by improper trimming and shoeing techniques, in addition to shoeing that characterizes long toe and low heel. Man employs horses for a variety of uses. Horses are bred for various purposes. A thoroughbred racehorse and a horse used for cutting have very different structures and build. However, despite the differences in horse type and the bone and hoof structure needed for related uses, correct trimming and proper shoeing remain similar, and necessary. GOLDENWINGSHORSESHOES provide complete guidelines for the care of the horse hoof, from the purchase of the proper shoe (measurement) to fitting, to trimming using the Golden Ratio (nature and science). Traction without slipping, sole protection, shoes that flex with the hoof rather than break or bend, providing proper angles to prevent unnecessary leverage on any portion of the horse’s body are the reasons for the development of the GOLDENWINGSHORSESHOES. Our mission is to provide for and preserve the integrity of the entire structure of the horse – SOUND from the ground up. GoldenWings began over 60 years ago when my two grandfathers in Western Pennsylvania noticed a simple peculiarity about horses. One a farmer and the other a logger realized that horses don’t pull a load. Horses push loads. They push with their toes and land on their heels. Horses, they knew, could land level and straight with traction. The idea of GOLDENWINGS was born. We began racing standard bred horses. At the racetrack, an Amishman shoed Amish road horses. He came weekly to reset or modify the shoes of our horses for racing at the county fairs. This blacksmith knew the adjustments would give them traction without interference, to land on the heel and push off straight with the toes. Race horses needed to have as little weight as possible for speed. In addition, the Amishman believed in short toes, higher heels and fractions of inches and ounces to make a difference. He kept accurate records of measurements to make necessary adjustments when he returned to check the horses. The result, a long time coming, is today’s state of the art GOLDENWINGSHORSESHOES. The Blacksmith used detailed records on a 4-week schedule. He experimented with different widths, weight of shoes, half rounds, half round with half swedge, flip flops, toe weights and toe grabs. He worked bending, welding, cutting, rolled toe shoes, cutting off grabs, adding studs, borium spots or nails for traction. Shoes were always light, using the least weight possible. Of significant importance was the realization that the Frog was the key to hoof balance – and further – for each individual horse. No one shoe was going to work for all horses. For example, the man noticed that some frogs point the wrong direction for horses to land and leave straight. This could cause some horses to get into their knees, causing interference. Some frogs are short and others long. Shoes now had to be created for numerous hoof differences and challenges. 10 years of experimenting with materials has produced a special compound that is very light in weight and actually simulates the flexibility of the natural hoof. This SECRET COMPOUND TECHNOLOGY allows the frog to do its job with traction and cushion. GOLDENWINGSHORSESHOES provide a shoe for your horse that is closest to how a natural (bare) hoof would feel and perform. GOLDENWINGSHORSESHOES are the most revolutionary horseshoe created since the Romans used Hippo Sandals over 2000 years ago. From ancient times to the present, man has developed many methods trying to protect the hoof of the horse. Some of these methods are known to have crippled more horses than they’ve helped. The health and strength of the hoof is critical to the horse’s overall soundness. The time is now to bring horseshoes up to modern day standards with up to date science to back the methodology and technology to develop the shoe’s structure, design and material. GOLDENWINGSHORSESHOES have been designed to accommodate the uses that mankind has imposed on the horse. Though the following description of some natural laws may seem odd and inappropriate for the product, I implore you to take a minute to see if it does indeed make sense to you as the future owner of GOLDENWINGSHORSESHOES for your horse. This concept in nature is the basis for individual growth of all things – including horses. For example, personal arm and leg length in a human is usually (barring syndrome influences) proportional to the torso. The same can be assumed in leaf size on a flower stem or wing size on a bumble bee. Leonardo Di Vinci believed that ideal proportions are governed by the harmonious proportions that govern the universe. 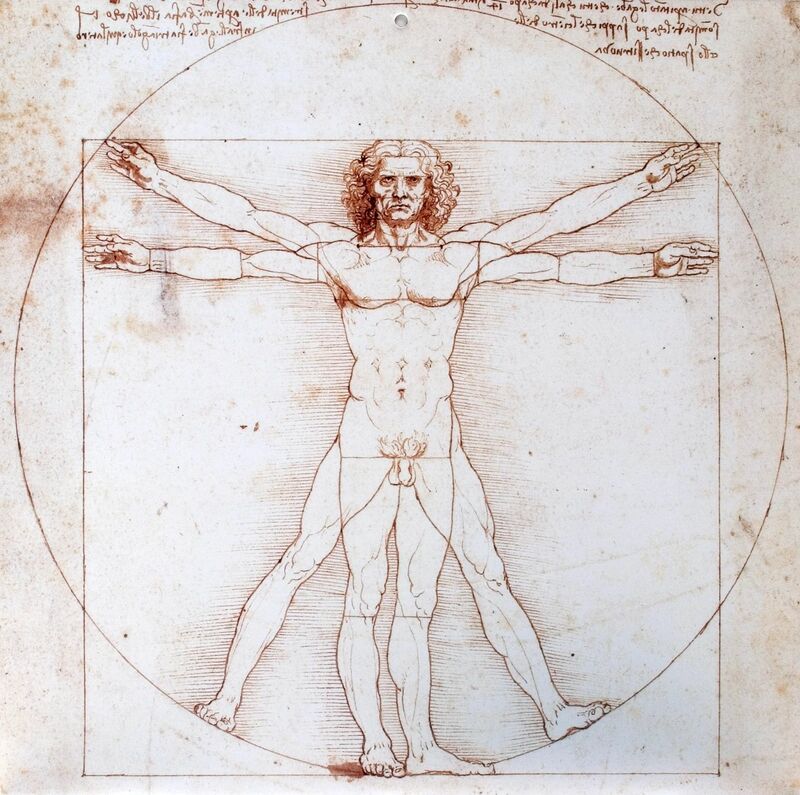 His Vitruvian Man is an example of how two or more body parts are used to relate to each other as well as the whole. Michelangelo applied the Golden Ratio (as did other Renaissance artists) to carve the Statue of David from a block of granite. It is said that the Statue of David is the most perfect model of the human form. This philosophy involves natures’ numbering system as applicable to the growth of all living things. Fibonacci numbering takes one number and adds it to the next to get the next number in the sequence. For example 1…1…2…3…5…8…13…21…etc. As the sequence expands, a perfect number is found – 1.68 – known as The Golden Ratio Number in Nature and the Universe. 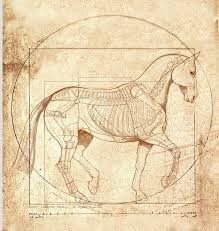 All animal structures, appearance and design are influenced by the Golden Ratio. For example, a tiger’s markings fall at the Golden Ratio which define the length and width of the lines on its face and stripes on its body. A dorsal fin of a dolphin, using the Golden Ratio, determines the width of its tail. All creatures, including YOU, are designed with this amazing principle of nature! The numbering sequence establishes a technique for finding minimum/maximum values within a range or area. Fibonacci incorporated values for triples of points whose distance forms the Golden Ratio. In the case of GOLDENWINGSHORSESHOES, the triple points are the two sides of the frog and the toe. Obviously, proper trimming will affect the Golden Ratio. The changeable number is the measurement for the toe, thus the angle for this horse. GOLDENWINGSHORSESHOES were designed using the Golden Ratio for the Divine Proportions with Fibonacci Numbers. The resulting ratio, in combination with the concept of triangulation provides the exact numbers needed for the length of the toe. Triangulation is a common technique incorporated in land surveying. Through this technique, one is able to determine a single point in space based on two other distinct points. The study of these philosophies, in conjunction with nature’s numbering system provides for knowledge of a horse’s hoof, allowed for the creation of the masterpiece GOLDENWINGSHORSESHOES. GOLDENWINGSHORSESHOES can achieve hoof balance starting with the frog. This rubbery organ makes contact with the ground first, along with the heel. From a total hoof perspective, the frog never changes. It makes sense then for this to be the first place to examine on a horse’s foot. In the design of this new horseshoe, the frog is exposed to allow proper use for ongoing health and integrity. A healthy frog occurs from performing its’ shock absorption job. The shoe also protects the coffin bone (the last bone in the leg inside the hoof), as well as added protection for the navicular bone, the sole and the deep flexor tendon. GOLDENWINGSHORSESHOES places up to 14 mm of flexible shoe material between the hoof and the terrain. In addition, GOLDENWINGSHORSESHOES are the first and only shoe that allows the sole and outer structure of the hoof, the walls, to be supported as well as used as both were intended to be used on a barefoot horse. The wall of a hoof is the protective shield that covers the sensitive internal tissues. It also serves to dissipate the energy produced in the foot and leg (and whole) of the horse with each heel strike or stride. GOLDENWINGSHORSESHOES provide connectivity for the entire hoof structure, not just the wall as current day shoes are designed. Feral and wild horses, such as the Mustang and Brumby, are not shod. They are barefoot and rarely (as far as we know) have disease and lameness associated with hoof issues. Upon examination of the barefoot hoof one finds shorter toes and thicker soles and hooves with higher angles. Nature’s design is ideal, exerting less leverage with each stride! It is interesting to find that the US Calvary adjusted their horses (upon purchase) by raising the angles in front to 56 degrees or more to prevent lameness. They consequently also raised the rears the same or slightly higher to accommodate this new angle. GOLDENWINGSHORSESHOES are unique in that they eliminate long toes and low heels. According to many experts, poor performance and lameness are often caused by improper trimming and shoeing techniques. It is beneficial that the farrier shoeing a GOLDENWINGSHORSESHOE understand proper trimming, measuring and fitting by using the Golden Ratio. GOLDENWINGSHORSESHOES allow the entire foot of the horse to become the bearing surface as it lands with each stride, heel first. GOLDENWINGSHORSESHOES have nail holes designed to place the nail properly even if the hoof wall has been damaged due to trauma, injury or improper trimming. A minimum of hoof wall should be displaced as possible with nails during shoe attachment. GOLDENWINGSHORSESHOE are designed to fit from the heel buttress forward since this is where the most impact occurs during stride. This added protection may aid in the prevention of Navicular Syndrome. The design also provides protection from stone bruises. Its thickness and flexibility insure protection for the sole and the entire hoof. GOLDENWINGSHORSESHOES provides more square inches of hoof protection than ordinary shoes, and the flexible hoof mechanism ensures blood circulation within the hoof. A hoof at 40 MPH on a 1200 lb horse can exert up to 12,800 lbs per square inch! Finally, our shoe is made from a material similar to the characteristics of the natural hoof. It is light in weight, slightly over 3 oz. (slightly more than the amount removed in normal trimming). The traction is self-cleaning with every stride, forcing dirt and debris from the traction area of the shoe upon landing. This also serves to prevent excessive slipping. The wild or feral horse is barefoot. What has made domesticated horses need shoes? Most likely – MAN. The challenges introduced to horses by man include endurance, sports, racing, trail riding, added weight of a rider, pulling equipment, tack weight, etc. All these activities have put increased strain on the hoof of a horse. When the hoof hits the terrain, the shape changes. The plantar arch flattens. The solar cavity decreases in depth and heels spread. The hoof diameter increases to a dilated state as the hoof capsule experiences significant changes in structural integrity. The pressure in the hoof rises and blood is squeezed out of soft tissues, causing a secondary pumping action (along with the pumping action of the frog). Then more change occurs – back to the resting state – as the hoof is raised off the ground for the continuation of stride. All this occurs in the hoof whether barefoot or shoed. Man, however, has added the elements of concrete surfaces, asphalt and gravel, all which increases the strain upon the hoof. Domesticated horses need protection that results in good health and increased longevity. GOLDENWINGSHORSESHOES provide the present day answer! GOLDENWINGSHORSESHOES suggests that farrier’s contact a veterinarian for advice regarding pre-existing conditions of any foot/hoof problems before applying the GOLDENWINGSHORSESHOES or any horseshoe, or before performing any trimming procedures.